This is chapter 8 of the User Guide for the Allegro CL 10.1 Integrated Development Environment (IDE). 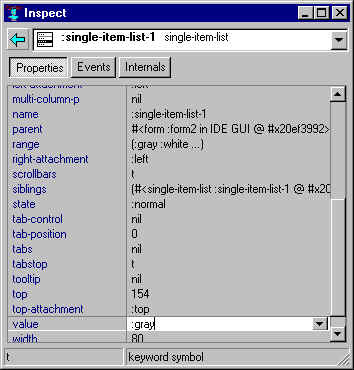 The IDE is only supported on Windows machines. 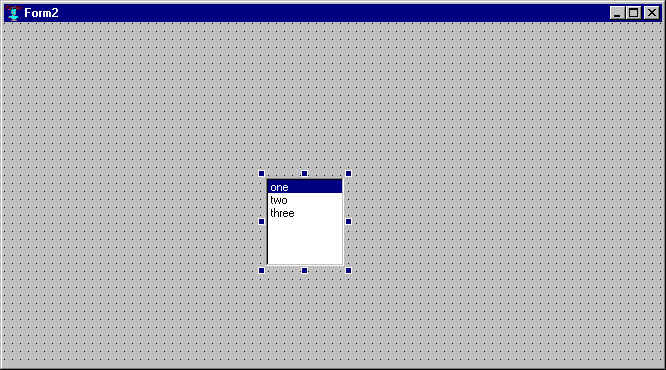 Events are a critical component of any visual application, that is one where users communicate with an application through windows and dialogs. An event is a mouse action (clicking a button, moving the mouse). Keyboard actions (typing a character, e.g.) are also an event but keyboard events are typically handled automatically. This chapter mostly deals with events occuring on controls. Controls, as we will describe, have built-in event handlers that can easily be made to perform what task is desired in response to events. Catching events not over controls is more complicated. See the essay cg-events.htm for more information. General Common Graphics and IDE documentation is described in doc/cgide.htm. The HTML documentation files can be accessed from the Allegro CL Integrated Development Environment using the Help | Allegro CL Documentation menu command (which displays introduction.htm, which in turn contains a list of all essay help files, including doc/cgide.htm). The remainder of this chapter discusses event handler functions on controls only. This example is designed for programmers who are new to events. If you are already familiar with events, you may wish to skip down to the next section. '(format t "Action at ~D~%"
We are going to define a function that causes this printing and see what happens when that function is associated with various events on a form. The argument list, (&rest args) accepts any number of arguments (including none), bundles them into a list and makes that list the value of args. (declare (ignore args)) tells the system args will not be used. In this simplistic example, we are not concerning ourselves with what arguments are actually passed to event functions nor with what might be done with these arguments. We are simply interested in seeing when events happen. In a real application, the arguments will typically be used rather than ignored. (get-universal-time) returns an integer which is the number of seconds from 00:00:00 GMT midnight, December 31, 1899/January 1, 1900. Therefore, a different value will be printed each time, indicating the number of seconds since the last call. We do this simply to ensure the printed messages can be distinguished from one another. Stop running the form (click Run | Stop). 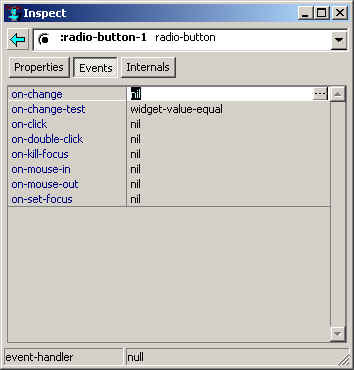 Using the Inspector window, change the value of the on-double-click for the radio button back to nil. Try setting other values to foo (except on-change-test where foo is not an appropriate value) and trying some mouse actions to see what happens. In this way, when you run the form again using Run | Run Form, you can get a feel for the mouse (or keyboard) action associated with an event. When a dialog has focus, one of the controls on the dialog (if there are more than one  that is why the check box is there) has focus within the dialog. This is usually visually evident because the border is modified. 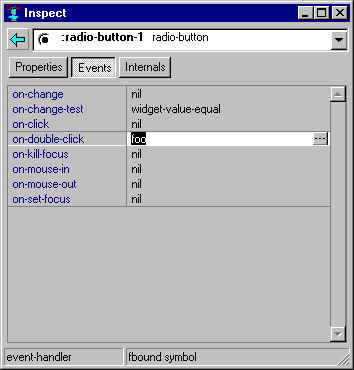 In the picture above, the radio button has focus and Radio Button is outlined. If you make on-set-focus foo (as we did with on-double-click above), and run the form, a message will be printed in the debug window when you click over the radio button, causing it to have focus. Pressing the Tab key also moves the focus about the dialog, from the radio button to the check box and back (you must have clicked on the radio button first, or tabbing will not select it). Press Tab repeatedly and a message is printed every other press (as the focus moves back from the check box to the radio button). This event function is run when the focus moves away from the radio button control. This event function is run when the mouse cursor moves over the control (regardless of where the focus on the window is, no clicks necessary). As you move the mouse back and forth over the radio button, messages will be printed in the debug window. If you move the mouse a lot, there will be a lot of messages. This is a good time to tell or remind you that on-mouse-in and on-mouse-out event functions should (1) be fast (because can run many, many times); (2) not have a permanent effect (since the mouse moving may be accidental  actions that have permanent effect should require a deliberate action such as a mouse click). 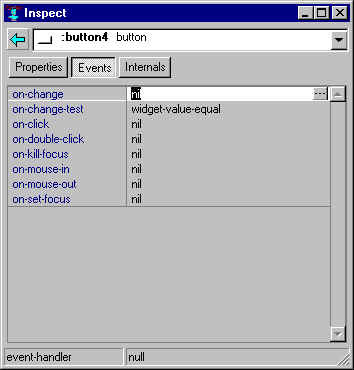 Typical on-mouse-in and -out event functions do simple visual things such as changing the cursor. This is the end of our simplistic example. We call it simplistic because in a real application, event functions will not simply print useless messages to a text-edit window. The purpose of this example was to show when event functions are run and what actions trigger them. In our simple example, our event function simply wrote a message to a text-edit window saying that the event had occurred. This is not, of course, a useful event-handling function (users usually know that they did something with the mouse and do not need to be told). However, usefulness is only meaningful in the context of your application. This is a complete function definition, so far doing nothing except returning t. The system calls the on-change event handler function with three arguments: widget (the control whose values has changed, the button in this case); the new-value and the old-value. This function must return non-nil (t or any other value except nil) in order for the change to be effected (with some exceptions  radio buttons change whether the event handler returns true or nil, indeed even when there is no event handler). Generally, if this function returns nil, the change is rejected and the previous value returned to the control (though other side-effects performed by the on-change function are not undone, of course). You can add code to the function so it will do additional things in your application. We want to make choosing a color have the effect of changing the background-color of the control. 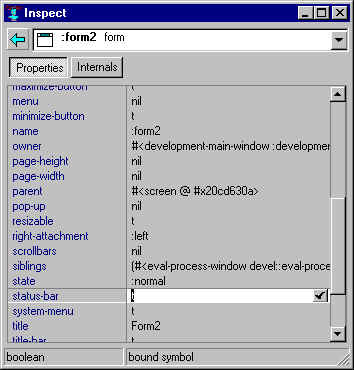 The invalidate form makes sure that the background color change is put into effect (covering and uncovering the running form has the same effect). If you evaluate the new definition (click Tools | Incremental Evaluation with the cursor just after the final parenthesis) and you run the form, you can change the background color by clicking the appropriate value. Now clicking on a new value causes the color to change and causes a message to be printed in the status bar. But, as we said, clicking on the current value does not cause anything new to be printed in the status bar because the system compares the old value and the new value using the on-change-test handler. The on-change handler will only be run if the on-change-test indicates that the old-value and the new-value are different by returning nil. 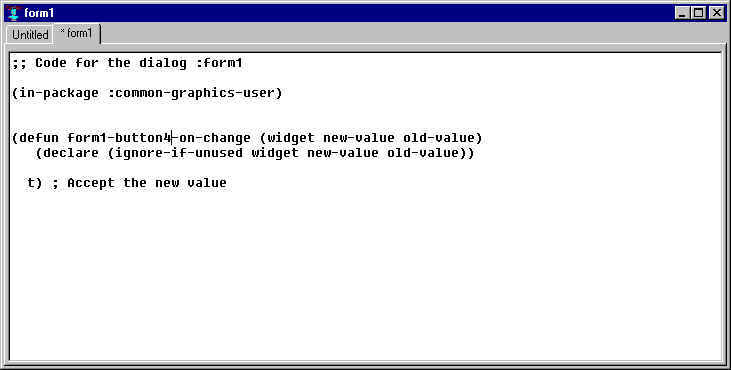 The default on-change-test is the function widget-value-equal and that function returns true for the same value. To get something to happen with every click, you can change the on-change-test function (to, for example, always return nil). But this is not the recommended way. Instead, if you want feedback to the user confirming that their click was received, use the on-click handler, as we describe next. Now when you click the same color, a message appears in the status bar. We have two messages being sent to the status bar when a new color is clicked: one from the on-click and one from the on-change, and only one ends up visible. But that doesn't matter for our purpose, which is just to confirm to the user that the click was received. See section 4.15.5 in chapter 4 Projects for information on how to display another window in your application. Similar code can go into an event handler (allowing you to have clicking a button pop-up or otherwise display another window in your application). Go to beginning of this chapter. Documentation for Allegro CL version 10.1. This page has been moderately modified from the 10.0 version.